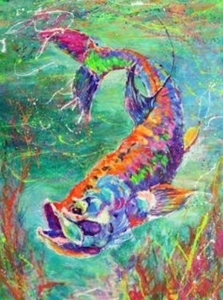 One of the paintings in my Florida Floats My Boat series is this guy, a Gulf of Mexico snook. From time to time, I like to wet a line, and snook are one of the best for all-around fighting sportfish. When you hook them, they like to take out your line and run. They’ll even jump trying to spit the hook. Small Snook leap high in the air, like a Ladyfish, while the really big females manage to clear only about half their bodies. Snook are also masters at utilizing shoreline roots or any other obstructions to their advantage. Back in 1929 and the early ‘30s when Matlacha Island was first being settled, the people who came here fished for their food. It was the Depression and people didn’t have much money and “if you didn’t fish, you didn’t live,” according to an early resident by the name of Ernie L ong. Today, snook generally range in size from 3 to 15 pounds, with 20 and 30 pounders being considered huge. But back then, 50 pound snook were common! And the fishing was bountiful. 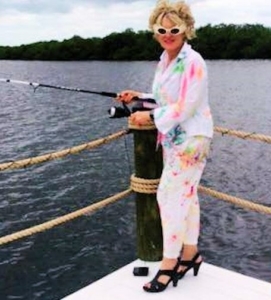 One settler by the name of Gay Kuhn caught 38 snook in less than two hours, and her husband, George, caught 49! The Kuhns also remember scooping up 2,000 shrimp in an hour using just a little net. But that was then and with releases from Lake Okeechobee and overfishing, the fish don’t get as big and they’re not as plentiful. But when you do snag a snook, they sure are fun!